Falun metal titans SABATON sells platinum! Sweden's premier metal band, Sabaton, have eclipsed that magical mark with their latest album "Carolus Rex", thus certifying it platinum in Sweden. This is the first time in history that a Swedish Heavy Metal band has sold platinum in their home country and not to mention a rarity for not only metal bands but all bands in general in today’s musical climate. Having been released a little over one year ago, sales show no sign of slowing down with “Carolus Rex” still on both the official top 100 album chart as well as the Spotify album chart in Sweden, an amazing achievement and one that indicates “Carolus Rex” is yet to reach its full potential. "This is unbelievable,” says Sabaton bassist Pär Sundström. “I'm taken and have trouble finding the words. It’s a milestone in our career and shows that everything we ever stood and fought for has been feasible. This has hardly been a bed of roses but acknowledgement like this means that we can get through anything. 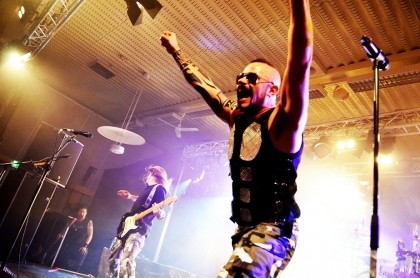 Sabaton’s resent nation tour, dubbed “Swedish Empire Tour” in 2012, was one of the greatest hard-rock tours ever undertaken by a Swedish band in Sweden. It was part of the 2-year-long world tour that before it ends will see the band play in excess of 200 gigs in all parts of the globe. It will of course include the two upcoming Swedish shows with Iron Maiden (Malmo Stadium and the newly built 50 000 plus capacity Friends Arena), which are two of a number of dates the band are playing with Iron Maiden in a tour that finishes in the U.S. this fall. The band have also announced that as a treat to their loyal fan base they will perform their entire "Art of War" album, which fans know was the album that helped break the band outside of Sweden, during the bands set at their own festival, Sabaton Open Air, in Falun in August and to end off an amazing 2013, Sabaton will release a live DVD in the late Autumn which was recorded in Poland 2012 when they played in front of over 600 000 people. Following this the band will retreat to the record studio for the winter of 2013/2014 where they will start working on the follow up to “Carolus Rex”. "Carouls Rex" contains a total of 13 tracks and was release with both English and Swedish vocals via Nuclear Blast. It is the band's sixth studio album. "As Sabaton we normally write about history, but today those tables are turned and we can proudly say that we ourselves have now become a part of history! We have just received the amazing news that our album Carolus Rex has now reached platinum sales in Sweden and that we are the only Swedish heavy metal band ever to have done this. So that makes Carolus Rex the most successful Swedish heavy metal album ever! This is an amazing achievement, a milestone and proof that all the long tours, hard work and difficult choices we have had to make have been the right ones. Our biggest thanks from the deepest of our hearts to all the people who have supported us on this journey. No words are enough for what you have done for us or what we feel today."